For the comic strip, see Peanuts. For other uses, see Peanut (disambiguation). "Goober peas" redirects here. For the folk song, see Goober Peas. Cultivated peanuts (A. hypogaea) arose from a hybrid between two wild species of peanut, thought to be A. duranensis and A. ipaensis. The initial hybrid would have been sterile, but spontaneous chromosome doubling restored its fertility, forming what is termed an amphidiploid or allotetraploid. Genetic analysis suggests the hybridization event probably occurred only once and gave rise to A. monticola, a wild form of peanut that occurs in a few restricted locations in northwestern Argentina, and by artificial selection to A. hypogaea. The process of domestication through artificial selection made A. hypogaea dramatically different from its wild relatives. The domesticated plants are bushier and more compact, and have a different pod structure and larger seeds. The initial domestication may have taken place in northwestern Argentina, or in southeastern Bolivia, where the peanut landraces with the most wild-like features are grown today. From this primary center of origin, cultivation spread and formed secondary and tertiary centers of diversity in Peru, Ecuador, Brazil, Paraguay, and Uruguay. Over time, thousands of peanut landraces evolved; these are classified into six botanical varieties and two subspecies (as listed in the peanut scientific classification table). Subspecies A. h. fastigiata types are more upright in their growth habit and have shorter crop cycles. Subspecies A. h. hypogaea types spread more on the ground and have longer crop cycles. The oldest known archeological remains of pods have been dated at about 7,600 years old. These may be pods from a wild species that was in cultivation, or A. hypogaea in the early phase of domestication. They were found in Peru, where dry climatic conditions are favorable to the preservation of organic material. Almost certainly, peanut cultivation antedated this at the center of origin where the climate is moister. Many pre-Columbian cultures, such as the Moche, depicted peanuts in their art. Cultivation was well established in Mesoamerica before the Spanish arrived. There, the conquistadors found the tlālcacahuatl (the plant's Nahuatl name, whence Mexican Spanish cacahuate, Castilian Spanish cacahuete, and French cacahuète) being offered for sale in the marketplace of Tenochtitlan. The peanut was later spread worldwide by European traders, and cultivation is now very widespread in tropical and subtropical regions. In West Africa, it substantially replaced a crop plant from the same family, the Bambara groundnut, whose seed pods also develop underground. In Asia, it became an agricultural mainstay and this region is now the largest producer in the world. In the English-speaking world, peanut growing is most important in the United States. Although it was mainly a garden crop for much of the colonial period, it was mostly used as animal feed stock until the 1930s. The United States Department of Agriculture initiated a program to encourage agricultural production and human consumption of peanuts in the late 19th and early 20th centuries. George Washington Carver developed hundreds of recipes for peanuts during his tenure in the program. Peanut is an annual herbaceous plant growing 30 to 50 cm (1.0 to 1.6 ft) tall. As a legume, it belongs to the botanical family Fabaceae (also known as Leguminosae, and commonly known as the bean or pea family). Like most other legumes, peanuts harbor symbiotic nitrogen-fixing bacteria in their root nodules. The leaves are opposite and pinnate with four leaflets (two opposite pairs; no terminal leaflet); each leaflet is 1 to 7 cm (⅜ to 2¾ in) long and 1 to 3 cm (⅜ to 1 in) across. Like many other legumes, the leaves are nyctinastic, that is, they have "sleep" movements, closing at night. The flowers are 1.0 to 1.5 cm (0.4 to 0.6 in) across, and yellowish orange with reddish veining. They are borne in axillary clusters on the stems above ground and last for just one day. The ovary is located at the base of what appears to be the flower stem but is actually a highly elongated floral cup. Peanut pods develop underground, an unusual feature known as geocarpy. After fertilization, a short stalk at the base of the ovary (termed a pedicel) elongates to form a thread-like structure known as a "peg". This peg grows down into the soil, and the tip, which contains the ovary, develops into a mature peanut pod. Pods are 3 to 7 cm (1.2 to 2.8 in) long, normally containing one to four seeds. Peanuts grow best in light, sandy loam soil with a pH of 5.9–7. 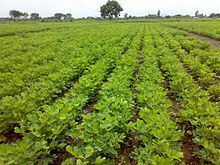 Their capacity to fix nitrogen means that, providing they nodulate properly, peanuts benefit little or not at all from nitrogen-containing fertilizer, and they improve soil fertility. Therefore, they are valuable in crop rotations. Also, the yield of the peanut crop itself is increased in rotations, through reduced diseases, pests and weeds. For instance, in Texas, peanuts in a three-year rotation with corn yield 50% more than nonrotated peanuts. Adequate levels of phosphorus, potassium, calcium, magnesium, and micronutrients are also necessary for good yields. To develop well, peanuts need warm weather throughout the growing season. They can be grown with as little as 350 mm (14 in) of water, but for best yields need at least 500 mm (20 in). Depending on growing conditions and the cultivar of peanut, harvest is usually 90 to 130 days after planting for subspecies A. h. fastigiata types, and 120 to 150 days after planting for subspecies A. h. hypogaea types. Subspecies A. h. hypogaea types yield more, and are usually preferred where the growing seasons are long enough. Peanut plants continue to produce flowers when pods are developing, therefore even when they are ready for harvest, some pods are immature. The timing of harvest is an important decision to maximize yield. If it is too early, too many pods will be unripe. If too late, the pods will snap off at the stalk, and will remain in the soil. For harvesting, the entire plant, including most of the roots, is removed from the soil. The pods are covered with a network of raised veins and are constricted between seeds. Harvesting occurs in two stages: In mechanized systems, a machine is used to cut off the main root of the peanut plant by cutting through the soil just below the level of the peanut pods. The machine lifts the "bush" from the ground and shakes it, then inverts the bush, leaving the plant upside down on the ground to keep the peanuts out of the soil. This allows the peanuts to dry slowly to a little less than a third of their original moisture level over a period of three to four days. Traditionally, peanuts were pulled and inverted by hand. After the peanuts have dried sufficiently, they are threshed, removing the peanut pods from the rest of the bush. It is particularly important that peanuts are dried properly and stored in dry conditions. If they are too high in moisture, or if storage conditions are poor, they may become infected by the mold fungus Aspergillus flavus. Many strains of this fungus release toxic and highly carcinogenic substances called aflatoxins. There are many peanut cultivars grown around the world. The market classes grown in the United States are Spanish, Runner, Virginia, and Valencia. Peanuts produced in the United States are divided into three major areas: the southeastern United States region which includes Alabama, Georgia, and Florida; the southwestern United States region which includes New Mexico, Oklahoma, and Texas; and the third region in the general eastern United States which include Virginia, North Carolina, and South Carolina. Certain cultivar groups are preferred for particular characteristics, such as differences in flavor, oil content, size, shape, and disease resistance. Most peanuts marketed in the shell are of the Virginia type, along with some Valencias selected for large size and the attractive appearance of the shell. Spanish peanuts are used mostly for peanut candy, salted nuts, and peanut butter. The small Spanish types are grown in South Africa, and in the southwestern and southeastern United States. Prior to 1940, 90% of the peanuts grown in the US state of Georgia, were Spanish types, but the trend since then has been larger-seeded, higher-yielding, more disease-resistant cultivars. Spanish peanuts have a higher oil content than other types of peanuts. In the United States, the Spanish group is primarily grown in New Mexico, Oklahoma, and Texas. Cultivars of the Spanish group include 'Dixie Spanish', 'Improved Spanish 2B', 'GFA Spanish', 'Argentine', 'Spantex', 'Spanette', 'Shaffers Spanish', 'Natal Common (Spanish)', "White Kernel Varieties', 'Starr', 'Comet', 'Florispan', 'Spanhoma', 'Spancross', 'OLin', 'Tamspan 90', 'AT 9899–14', 'Spanco', 'Wilco I', 'GG 2', 'GG 4', 'TMV 2', and 'Tamnut 06'. Since 1940, the southeastern US region has seen a shift to production of Runner group peanuts. This shift is due to good flavor, better roasting characteristics and higher yields when compared to Spanish types, leading to food manufacturers' preference for the use in peanut butter and salted nuts. Georgia's production is now almost 100% Runner type. Cultivars of Runners include 'Southeastern Runner 56-15', 'Dixie Runner', 'Early Runner', 'Virginia Bunch 67', 'Bradford Runner', 'Egyptian Giant' (also known as 'Virginia Bunch' and 'Giant'), 'Rhodesian Spanish Bunch' (Valencia and Virginia Bunch), 'North Carolina Runner 56-15', 'Florunner', 'Virugard', 'Georgia Green', 'Tamrun 96', 'Flavor Runner 458', 'Tamrun OL01', 'Tamrun OL02' 'AT-120', 'Andru-93', 'Southern Runner', 'AT1-1', 'Georgia Brown', 'GK-7', and 'AT-108'. The large-seeded Virginia group peanuts are grown in the US states of Virginia, North Carolina, Tennessee, Texas, New Mexico, Oklahoma, and parts of Georgia. They are increasing in popularity due to demand for large peanuts for processing, particularly for salting, confections, and roasting in the shells. Virginia group peanuts are either bunch or running in growth habit. The bunch type is upright to spreading. It attains a height of 45 to 55 cm (18 to 22 in), and a spread of 70 to 80 cm (28 to 31 in), with 80-to-90 cm (31-to-35 in) rows that seldom cover the ground. The pods are borne within 5 to 10 cm of the base of the plant. Cultivars of Virginia type peanuts include 'NC 7', 'NC 9', 'NC 10C', 'NC-V 11', 'VA 93B', 'NC 12C', 'VA-C 92R', 'Gregory', 'VA 98R', 'Perry', 'Wilson, 'Hull', 'AT VC-2' and' Shulamit'. 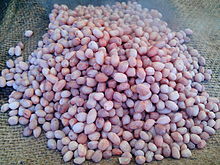 Valencia group peanuts are coarse, and they have heavy reddish stems and large foliage. In the United States, large commercial production is primarily in the South Plains of West Texas and eastern New Mexico near and south of Portales, New Mexico, but they are grown on a small scale elsewhere in the South as the best-flavored and preferred type for boiled peanuts. They are comparatively tall, having a height of 125 cm (49 in) and a spread of 75 cm (30 in). 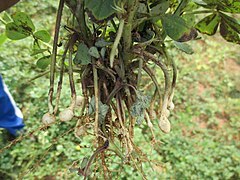 Peanut pods are borne on pegs arising from the main stem and the side branches. Most of the pods are clustered around the base of the plant, and only a few are found several inches away. Valencia types are three- to five-seeded and smooth, with no constriction of the shell between the seeds. Seeds are oval and tightly crowded into the pods. 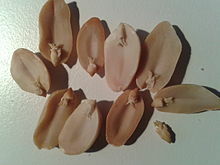 Typical seed weight is 0.4 to 0.5 g. This type is used heavily for sale roasted and salted in-shell peanuts and peanut butter. Varieties include 'Valencia A' and 'Valencia C'. These are alike, except for the color of the seed. Sometimes known also as Texas Red or White, the plants are similar to Valencia types, except the stems are green to greenish brown, and the pods are rough, irregular, and have a smaller proportion of kernels. In 2016, world production of peanuts (reported as groundnuts in shells) was 44 million tonnes, led by China with 38% of the global total followed by India (16%) (table). Other significant producers were Nigeria, the United States, and Sudan. Major exporters in 2013 were India with 541,337 tonnes, which accounts for 32% of world total exports (1.7 million tonnes), and the United States with 19% of total exports. The European Union imported 52% of the world supply of shelled peanuts in 2013, with the Netherlands alone accounting for 40% of the European total. In the United States, Georgia is the leading peanut-producing state, followed by Texas and Alabama, respectively. About half of all peanuts produced in the US are grown within a 100 mi (160 km) radius of Dothan, Alabama. Dothan is home to the National Peanut Festival established in 1938 and held each fall to honor peanut growers and celebrate the harvest. 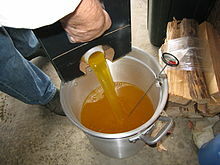 Peanut oil is often used in cooking, because it has a mild flavor and a relatively high smoke point. Due to its high monounsaturated content, it is considered more healthful than saturated oils, and is resistant to rancidity. The several types of peanut oil include: aromatic roasted peanut oil, refined peanut oil, extra virgin or cold-pressed peanut oil, and peanut extract. In the United States, refined peanut oil is exempt from allergen labeling laws. Peanut butter is a food paste or spread made from ground dry roasted peanuts. It often contains additional ingredients that modify the taste or texture, such as salt, sweeteners or emulsifiers. Peanut butter is served as a spread on bread, toast or crackers, and used to make sandwiches (notably the peanut butter and jelly sandwich). It is also used in a number of confections, such as peanut-flavored granola bars or croissants and other pastries. The United States is a leading exporter of peanut butter and itself consumes $800 million of peanut butter annually. Peanut flour is used as a gluten-free solution. Boiled peanuts are a popular snack in the southern United States, as well as in India, China, and West Africa. In the US South, boiled peanuts are often prepared in briny water, and sold in street side stands. Likewise, during colonial times in Peru, the Spanish used peanuts to replace nuts unavailable locally, but used extensively in Spanish cuisine, such as almonds and pine nuts, typically ground or as paste mixed with rice, meats, and vegetables for dishes like rice pilaf. Throughout the region, many candies and snacks are made using peanuts. In Mexico, it is common to find them in different presentations as a snack or candy: salty, "Japanese" peanuts, praline, enchilados or in the form of a very nutritious traditional sweet made with peanuts and honey called palanqueta, and even as peanut marzipan. Crunchy coated peanuts, called kabukim in Hebrew, are a popular snack in Israel. Kabukim are commonly sold by weight at corner stores where fresh nuts and seeds are sold, though they are also available packaged. The coating typically consists of flour, salt, starch, lecithin, and sometimes sesame seeds. The origin of the name is obscure (it may be derived from kabuk which means nutshell or husk in Turkish). An additional variety of crunchy coated peanuts popular in Israel is "American peanuts". The coating of this variety is thinner, but harder to crack. Bamba puffs are a popular snack in Israel. Their shape is similar to Cheez Doodles, but they are made of peanuts and corn. Peanuts are also widely used in Southeast Asian cuisine, such as in Malaysia, Vietnam, and Indonesia, where they are typically made into a spicy sauce. Peanuts originally came to Indonesia from the Philippines, where the legume derived from Mexico in times of Spanish colonization. One Philippine dish using peanuts is kare-kare, a mixture of meat and peanut butter. Common Indonesian peanut-based dishes include gado-gado, pecel, karedok, and ketoprak, vegetable salads mixed with peanut sauce, and the peanut-based sauce, satay. In the Indian subcontinent, peanuts are a light snack, usually roasted and salted (sometimes with the addition of chilli powder), and often sold roasted in pods or boiled with salt. They are also made into dessert or sweet snack pieces by processing with refined sugar and jaggery. Indian cuisine uses roasted, crushed peanuts to give a crunchy body to salads; they are added whole (without pods) to leafy vegetable stews for the same reason. Another use is peanut oil for cooking. Most Indians use mustard, sunflower, and peanut oil for cooking. In South India, groundnut chutney is eaten with dosa and idli as breakfast. 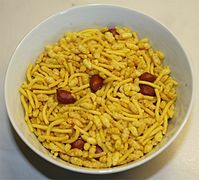 Peanuts are also used in sweets and savory items in South India and also as a flavor in tamarind rice. Kovilpatti is known for its sweet peanut chikki, which is also used in savory and sweet mixtures, such as Bombay mix. 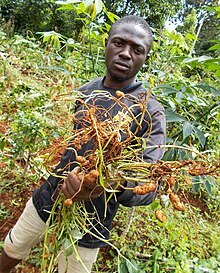 Peanuts grow well in southern Mali and adjacent regions of the Ivory Coast, Burkina Faso, Ghana, Nigeria, and Senegal; peanuts are similar in both agricultural and culinary qualities to the Bambara groundnut native to the region, and West Africans have adopted the crop as a staple. Peanut sauce, prepared with onions, garlic, peanut butter/paste, and vegetables such as carrots, cabbage, and cauliflower, can be vegetarian (the peanuts supplying ample protein) or prepared with meat, usually chicken. Peanuts are used in the Malian meat stew maafe. In Ghana, peanut butter is used for peanut butter soup nkate nkwan. Crushed peanuts may also be used for peanut candies nkate cake and kuli-kuli, as well as other local foods such as oto. Peanut butter is an ingredient in Nigeria's "African salad". Peanut powder is an important ingredient in the spicy coating for kebabs in Nigeria and Ghana. Peanuts are a common ingredient of several types of relishes (dishes which accompany nshima) eaten in Malawi and in the eastern part of Zambia, and these dishes are common throughout both countries. Thick peanut butter sauces are also made in Uganda to serve with rice and other starchy foods. Groundnut stew, locally called ebinyebwa in Uganda, is made by boiling ground peanut flour with other ingredients, such as cabbage, mushrooms, dried fish, meat or other vegetables. Across East Africa, roasted peanuts, often in cones of newspaper, are obtained from street vendors. In Canada and the United States, peanuts are used in candies, cakes, cookies, and other sweets. Individually, they are eaten dry-roasted with or without salt. Ninety-five percent of Canadians eat peanuts or peanut butter, with average consumption of 3 kilograms (6.6 lb) of peanuts per person annually, and 79% of Canadians consuming peanut butter weekly. In the United States, peanuts and peanut butter are central to American dietary practices, and are typically considered as comfort foods. Peanut butter is a common peanut-based food, representing half of American total peanut consumption and $850 million in annual retail sales. Peanut soup is found on restaurant menus in the southeastern states. In some southern portions of the US, peanuts are boiled for several hours until soft and moist. Peanuts are also deep-fried, sometimes within the shell. Per person, Americans eat 6 pounds (2.7 kg) of peanut products annually, spending a total of $2 billion in peanut retail purchases. Peanuts are used to help fight malnutrition. Plumpy Nut, MANA Nutrition, and Medika Mamba are high-protein, high-energy, and high-nutrient peanut-based pastes developed to be used as a therapeutic food to aid in famine relief. The World Health Organization, UNICEF, Project Peanut Butter, and Doctors Without Borders have used these products to help save malnourished children in developing countries. Peanuts can be used like other legumes and grains to make a lactose-free, milk-like beverage, peanut milk, which is promoted in Africa as a way to reduce malnutrition among children. Peanut plant tops and crop residues can be used for hay. The protein cake (oilcake meal) residue from oil processing is used as an animal feed and as a soil fertilizer. Groundnut cake is a livestock feed, mostly used by cattle as protein supplements. It is one of the most important and valuable feed for all types of livestocks and one of the most active ingredient for poultry rations. Poor storage of the cake may sometimes result in its contamination by aflatoxin, a naturally occurring mycotoxin that is produced by Aspergillus flavus and Aspergillus parasiticus. The major constituents of the cake are essential amino acids such as lysine and glutamine. Other components are crude fiber, crude protein, and fat. Some peanuts can also be fed whole to livestock, for example those in excess of the peanut quota in the USA, or those with a higher aflatoxin content than that permitted by the food regulations. Peanut processing often requires dehulling: the hulls generated in large amounts by the peanut industries can then be used to feed livestock, particularly ruminants. Peanuts are rich in essential nutrients (right table, USDA nutrient data). In a 100 g serving, peanuts provide 570 calories and are an excellent source (defined as more than 20% of the Daily Value, DV) of several B vitamins, vitamin E, several dietary minerals, such as manganese (95% DV), magnesium (52% DV) and phosphorus (48% DV), and dietary fiber (right table). They also contain about 25 g protein per 100 g serving, a higher proportion than in many tree nuts. Some studies show that regular consumption of peanuts is associated with a lower specific risk of mortality from certain diseases. However, the study designs do not allow cause and effect to be inferred. According to the US Food and Drug Administration, "Scientific evidence suggests but does not prove that eating 1.5 ounces per day of most nuts (such as peanuts) as part of a diet low in saturated fat and cholesterol may reduce the risk of heart disease." Peanuts contain polyphenols, polyunsaturated and monounsaturated fats, phytosterols and dietary fiber in amounts similar to several tree nuts. Peanut skins contain resveratrol which is under preliminary research for its potential effects in humans. A common cooking and salad oil, peanut oil is 46% monounsaturated fats (primarily oleic acid), 32% polyunsaturated fats (primarily linoleic acid), and 17% saturated fats (primarily palmitic acid). Extractable from whole peanuts using a simple water and centrifugation method, the oil is being considered by NASA's Advanced Life Support program for future long-duration human space missions. Some people (0.6% of the United States population) report that they experience allergic reactions to peanut exposure; symptoms are specifically severe for this nut, and can range from watery eyes to anaphylactic shock, which is generally fatal if untreated. Eating a small amount of peanut can cause a reaction. Because of their widespread use in prepared and packaged foods, the avoidance of peanuts can be difficult. The reading of ingredients and warnings on product packaging is necessary to avoid this allergen. Foods that are processed in facilities which also handle peanuts on the same equipment as other foods are required to carry such warnings on their labels. Avoiding cross contamination with peanuts and peanut products, (along with other severe allergens like shellfish) is a promoted and common practice which chefs and restaurants worldwide are becoming aware of. Studies comparing age of peanut introduction in Great Britain with introduction in Israel showed that delaying exposure to peanuts in childhood can dramatically increase the risk of developing peanut allergies. 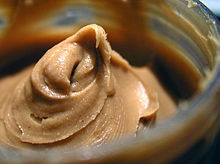 Peanut allergy has been associated with the use of skin preparations containing peanut oil among children, but the evidence is not regarded as conclusive. Peanut allergies have also been associated with family history and intake of soy products. Some school districts in the United States and elsewhere have banned peanuts. However, the efficacy of the bans in reducing allergic reactions is uncertain. A recent study in Canada has shown that there is no difference in the percentage of accidental exposures occurring in schools prohibiting peanuts than in schools allowing them. Refined peanut oil will not cause allergic reactions in most people with peanut allergies. However, crude (unrefined) peanut oils have been shown to contain protein, which may cause allergic reactions. In a randomized, double-blind crossover study, 60 people with proven peanut allergy were challenged with both crude peanut oil and refined peanut oil. The authors concluded, "Crude peanut oil caused allergic reactions in 10% of allergic subjects studied and should continue to be avoided." They also stated, "Refined peanut oil does not seem to pose a risk to most people with peanut allergy." However, they point out that refined peanut oil can still pose a risk to peanut-allergic individuals if oil that has previously been used to cook foods containing peanuts is reused. 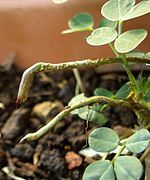 If peanut plants are subjected to severe drought during pod formation, or if pods are not properly stored, they may become contaminated with the mold Aspergillus flavus which may produce carcinogenic substances called aflatoxins. Lower-quality peanuts, particularly where mold is evident, are more likely to be contaminated. The United States Department of Agriculture tests every truckload of raw peanuts for aflatoxin; any containing aflatoxin levels of more than 15 parts per billion are destroyed. The peanut industry has manufacturing steps in place to ensure all peanuts are inspected for aflatoxin. ^ a b c "The Plant List: A Working List of All Plant Species". Royal Botanic Gardens, Kew and Missouri Botanical Garden. 2013. Retrieved February 13, 2015. ^ "Grain Legumes". www.hort.purdue.edu. Retrieved September 29, 2015. ^ "Oil crops for production of advanced biofuels". European Biofuels Technology Platform. Retrieved September 28, 2015. ^ a b "Legumes Of The World | Royal Botanic Gardens, Kew". www.kew.org. Retrieved September 29, 2015. ^ "The Peanut Institute – Peanut Facts". peanut-institute.org. ^ a b Seijo, Guillermo; Graciela I. Lavia; Aveliano Fernandez; Antonio Krapovickas; Daniel A. Ducasse; David J. Bertioli; Eduardo A. Moscone (December 1, 2007). "Genomic relationships between the cultivated peanut (Arachis hypogaea, Leguminosae) and its close relatives revealed by double GISH". American Journal of Botany. 94 (12): 1963–1971. doi:10.3732/ajb.94.12.1963. PMID 21636391. Retrieved July 5, 2010. ^ a b Kochert, Gary; Stalker, H. Thomas; Gimenes, Marcos; Galgaro, Leticia; Lopes, Catalina Romero; Moore, Kim (October 1, 1996). "RFLP and Cytogenetic Evidence on the Origin and Evolution of Allotetraploid Domesticated Peanut, Arachis hypogaea (Leguminosae)". American Journal of Botany. 83 (10): 1282–1291. doi:10.2307/2446112. JSTOR 2446112. ^ Moretzsohn, Márcio C.; Gouvea, Ediene G.; Inglis, Peter W.; Leal-Bertioli, Soraya C. M.; Valls, José F. M.; Bertioli, David J. (January 1, 2013). "A study of the relationships of cultivated peanut (Arachis hypogaea) and its most closely related wild species using intron sequences and microsatellite markers". Annals of Botany. 111 (1): 113–126. doi:10.1093/aob/mcs237. ISSN 0305-7364. PMC 3523650. PMID 23131301. ^ Husted, Ladley (1936). 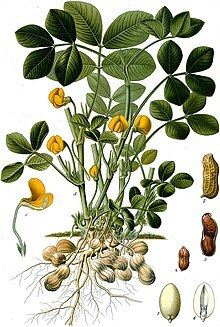 "Cytological Studies on the Peanut, Arachis. II". Cytologia. 7 (3): 396–423. doi:10.1508/cytologia.7.396. ^ Halward, Tracy; Stalker, Tom; LaRue, Elizabeth; Kochert, Gary (1992). "Use of single-primer DNA amplifications in genetic studies of peanut (Arachis hypogaea L.)". Plant Molecular Biology. 18 (2): 315–325. doi:10.1007/BF00034958. ISSN 0167-4412. PMID 1731991. ^ a b c d Krapovickas, Antonio; Gregory, Walton C. (1994). "Taxonomia del Genero Arachis (Leguminosae)" (PDF). Bonplandia. 8 (1–4): 1–186. ^ a b c d Krapovickas, Antonio; Gregory, Walton C. (2007). translated by David E. Williams and Charles E. Simpson. "Taxonomy of the genus Arachis (Leguminosae)" (PDF). IBONE. 16 (Supl. ): 1–205. ^ Dillehay, Tom D. "Earliest-known evidence of peanut, cotton and squash farming found". Retrieved June 29, 2007. ^ a b "Peanut (groundnuts with shell) production in 2016". FAOSTAT, Food and Agricultural Organization of the United Nations, Statistics Division. 2017. Retrieved November 5, 2018. ^ Putnam, D.H., et al. (1991) Peanut. University of Wisconsin-Extension Cooperative Extension: Alternative Field Crops Manual. ^ a b Smith, Ben W. (January 1, 1950). 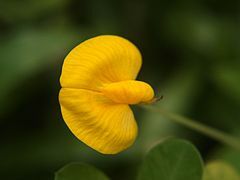 "Arachis hypogaea. Aerial Flower and Subterranean Fruit". American Journal of Botany. 37 (10): 802–815. doi:10.2307/2437758. JSTOR 2437758. ^ a b Schilling, Robert (February 5, 2003). "L'arachide histoire et perspectives". L'arachide histoire et perspectives. Agropolis Museum. Retrieved October 16, 2015. ^ Jauron, Richard (February 5, 1997). "Growing Peanuts in the Home Garden | Horticulture and Home Pest News". Ipm.iastate.edu. Retrieved May 30, 2011. ^ Marsalis, Mark; Puppala, Naveen; Goldberg, Natalie; Ashigh, Jamshid; Sanogo, Soumaila; Trostle, Calvin (July 2009). "New Mexico Peanut Production" (PDF). Circular-645. New Mexico State University. Retrieved October 16, 2015. ^ "Peanut". www.hort.purdue.edu. Retrieved October 16, 2015. ^ a b c "How peanuts are Grown – Harvesting – PCA". Peanut Company of Australia. Archived from the original on July 19, 2008. Retrieved May 30, 2011. ^ a b c Bilello, Stanley. 21st Century Homestead: Nitrogen-Fixing Crops. Lulu.com. pp. 93–94. ISBN 9781365452901. ^ a b c Ruark, Elinor. "Peanut Cultivars and Descriptions". caes2.caes.uga.edu. Retrieved November 22, 2016. ^ a b "Export quantities for 'Groundnuts shelled' in 2013; Crops and livestock products; pick lists for Regions/World list/Export quantity". FAOSTAT, Food and Agricultural Organization of the United Nations, Statistics Division. 2013. Retrieved April 7, 2017. ^ "Peanut Production in Alabama". The Encyclopedia of Alabama. June 14, 2011. Retrieved November 15, 2011. ^ "ALFA Farmers Federation – Alabama Peanut Producers". Alfafarmers.org. May 27, 2010. Retrieved May 30, 2011. ^ "Peanut Facts". Alabama Peanut Producers Association. Archived from the original on November 1, 2004. Retrieved May 30, 2011. ^ "Food Allergen Labeling and Consumer Protection Act of 2004 (Public Law 108-282, Title II)". Fda.gov. Retrieved May 30, 2011. ^ "Gastronomía de Huánuco - Platos típicos - Pachamanca Picante de cuy". www.huanuco.com. Retrieved October 26, 2015. ^ "Menú, recetas, cocina, nutricion | Menú Perú". menuperu.elcomercio.pe. Retrieved October 26, 2015. ^ "Demystifying mole, Mexico's national dish". www.mexconnect.com. Retrieved August 20, 2010. ^ "Ebinyebwa; a tale of the Ugandan groundnut stew". Daily Monitor/Monitor Publications Ltd, Kampala, Uganda. April 8, 2008. Retrieved December 28, 2015. ^ "Peanuts in Canada". Peanut Bureau of Canada. 2017. Retrieved December 6, 2017. ^ Karina Martinez-Carter (February 14, 2014). "As American as peanut butter". Pacific Standard. Retrieved December 6, 2017. ^ a b "History of Peanuts & Peanut Butter". US National Peanut Board. 2017. Retrieved December 6, 2017. ^ "The history of peanut soup". The Virginia Marketplace. September 19, 2012. Retrieved December 6, 2017. ^ "16 Fun Facts about Peanuts & Peanut Butter; Number 13". US National Peanut Board. 2017. Retrieved December 6, 2017. ^ Raymond, Bret. "Rwaza Health Centre: Efficacy Study Results" (PDF). MANA Nutrition. Retrieved July 15, 2011. ^ "Meds & Food For Kids :: — Medika Mamba". mfkhaiti.org. Archived from the original on April 8, 2010. Retrieved April 23, 2010. ^ "Fermented Grain Legumes, Seeds and Nuts". google.co.uk. Retrieved May 25, 2015. ^ "Palm kernel meal as a feed for poultry. 1. Composition of palm". Journal of Animal feed science. Retrieved May 25, 2015. ^ "3. Feed values and feeding potential of major agro-byproducts". fao.org. Retrieved May 25, 2015. ^ "Chemical Composition of Some Non-Conventional and Local Feed Resources for Poultry in Sudan". International Journal of Poultry Science. Retrieved May 25, 2015. ^ "Nutrition facts for peanuts, all types, raw, USDA Nutrient Data". Conde Nast, USDA National Nutrient Database, version SR-21. 2014. Retrieved January 15, 2015. ^ Bao, Ying; Han, Jiali; Hu, Frank B.; Giovannucci, Edward L.; Stampfer, Meir J.; Willett, Walter C.; Fuchs, Charles S. (November 21, 2013). "Association of Nut Consumption with Total and Cause-Specific Mortality". New England Journal of Medicine. 369 (21): 2001–2011. doi:10.1056/NEJMoa1307352. ISSN 0028-4793. PMC 3931001. PMID 24256379. ^ a b "Nuts (including peanuts)". Micronutrient Information Center. Corvallis, OR: Linus Pauling Institute, Oregon State University. 2009. Retrieved November 29, 2016. ^ Taylor CL (July 14, 2003). "Qualified Health Claims: Letter of Enforcement Discretion – Nuts and Coronary Heart Disease (Docket No 02P-0505)". Center for Food Safety and Applied Nutrition, FDA. Retrieved October 14, 2015. ^ "Resveratrol". Micronutrient Information Center. Corvallis, OR: Linus Pauling Institute, Oregon State University. 2016. ^ Sales, J. M.; Resurreccion, A. V. (2014). "Resveratrol in peanuts". Critical Reviews in Food Science and Nutrition. 54 (6): 734–70. doi:10.1080/10408398.2011.606928. PMID 24345046. ^ "Nutrition facts for oil, peanut, salad or cooking, USDA Nutrient Data". Conde Nast, USDA National Nutrient Database, version SR-21. 2014. Retrieved January 15, 2015. ^ Ozcan MM (2010). "Some nutritional characteristics of kernel and oil of peanut (Arachis hypogaea L.)". J Oleo Sci. 59 (1): 1–5. PMID 20032593. ^ "Food Allergy Quick Facts". National Institute of Allergy and Infectious Diseases. February 24, 2012. Retrieved January 30, 2014. 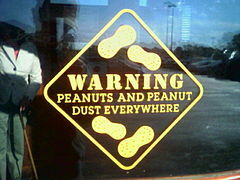 ^ "Peanut Allergy on the Rise: Why?". WebMD. May 14, 2010. Retrieved May 18, 2010. ^ Høst, A; Halken, S; Muraro, A; Dreborg, S; Niggemann, B; Aalberse, R; Arshad, SH; Von Berg, A; et al. (2008). "Dietary prevention of allergic diseases in infants and small children". Pediatric Allergy and Immunology. 19 (1): 1–4. doi:10.1111/j.1399-3038.2007.00680.x. PMID 18199086. ^ a b Lack G, Fox D, Northstone K, Golding J (2003). "Factors Associated with the Development of Peanut Allergy in Childhood". New England Journal of Medicine. 348 (11): 977–85. doi:10.1056/NEJMoa013536. PMID 12637607. ^ Hartocollis, Anemona (September 23, 1998). "Nothing's Safe: Some Schools Ban Peanut Butter as Allergy Threat". The New York Times. Retrieved August 18, 2009. ^ Nevius, C.W. (September 9, 2003). "One 5-year-old's allergy leads to class peanut ban". San Francisco Chronicle. Retrieved August 18, 2009. ^ "School peanut ban in need of review". Nashua Telegraph. September 14, 2008. Retrieved August 18, 2009. ^ Cherkaoui, Sabrine; Ben-Shoshan, Moshe; Alizadehfar, Reza; Asai, Yuka; Chan, Edmond; Cheuk, Stephen; Shand, Greg; St-Pierre, Yvan; Harada, Laurie (January 1, 2015). 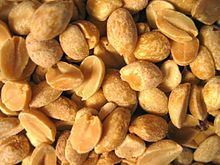 "Accidental exposures to peanut in a large cohort of Canadian children with peanut allergy". Clinical and Translational Allergy. 5: 16. doi:10.1186/s13601-015-0055-x. ISSN 2045-7022. PMC 4389801. PMID 25861446. ^ "The anaphylaxis campaign: peanut oil". Anaphylaxis.org.uk. Archived from the original on April 18, 2008. Retrieved August 18, 2009. ^ Hoffman DR, Collins-Williams C (1994). "Cold-pressed peanut oils may contain peanut allergen". The Journal of Allergy and Clinical Immunology. 93 (4): 801–2. doi:10.1016/0091-6749(94)90262-3. PMID 8163791. ^ Hourihane JO, Bedwani SJ, Dean TP, Warner JO (1997). "Randomised, double blind, crossover challenge study of allergenicity of peanut oils in subjects allergic to peanuts". BMJ. 314 (7087): 1084–8. doi:10.1136/bmj.314.7087.1084. PMC 2126478. PMID 9133891. ^ Hirano, S; Shima, T; Shimada, T (August 2001). "[Proportion of aflatoxin B1 contaminated kernels and its concentration in imported peanut samples]". Shokuhin Eiseigaku Zasshi. 42 (4): 237–42. doi:10.3358/shokueishi.42.237. PMID 11817138.